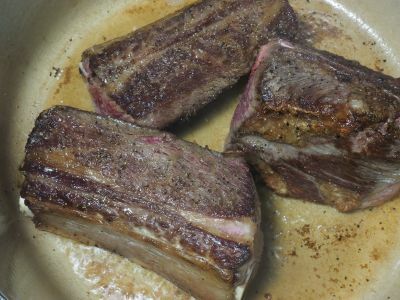 Beef short ribs can be somewhat tough if not cooked properly but when they are treated correctly, they become tender and very flavorful. It is not a difficult dish to prepare although it does take several hours in the oven to cook. So it's a great dish for a Sunday afternoon while watching a football game or even working in the yard. Simply prepare it, put it in the oven, and come back in an hour and a half or so. 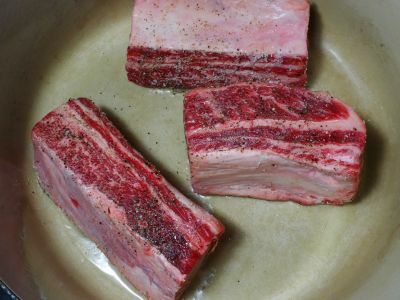 There are two primary cuts of short ribs, the "English" cut and the "Flanken" cut. 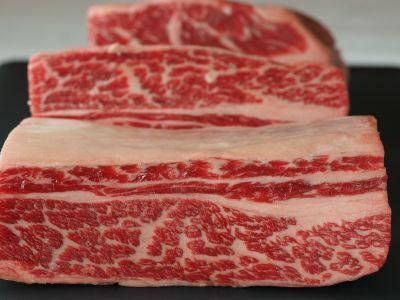 The English type are cut between the ribs so there is one bone per rib. They can then be cut into varied lengths from 3 to 6 inches or so. 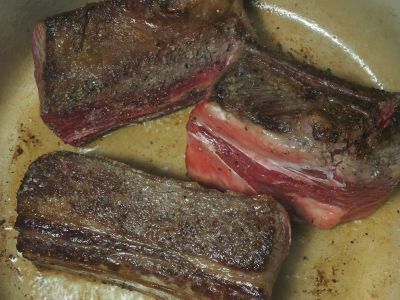 The English cut is usually braised so they cook for an extended period and with the single bone the length of the rib they hold up to the longer cooking process. The Flanken cut is cut across the ribs, so you will see 4-6 rib ends from the side of the rib. They are usually about a half inch thick so they lend themselves to grilling or quicker cooking methods. 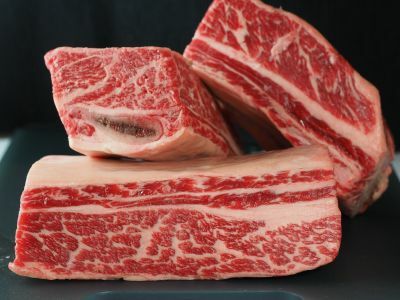 Korean ribs are Flanken style ribs. 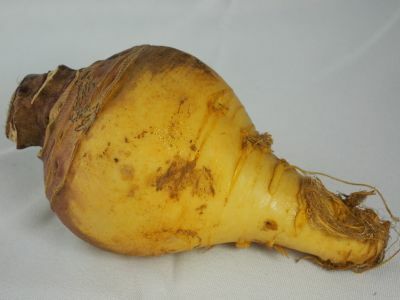 One thing I like to do with braised beef dishes is to add an earthy root vegetable like a turnip, rutabega or parsnip. 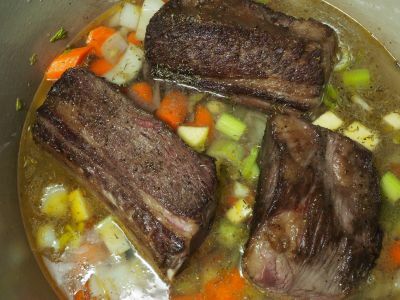 This adds a great flavor to the stock that is used to make the gravy. These can tend to be a little strong because I leave them in for the whole cooking process. Feel free to omit them or to just cut one in half and put a piece in with the meat when you add the liquid. Once the liquid is simmering and before it goes in the oven you can remove it if you want a softer flavor. So let's get cooking. Enjoy! 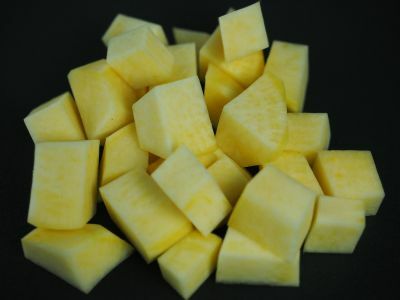 Note - The rutabaga or other root vegetables are optional and will add an earthier flavor to the dish. It will seem sweeter without any root vegetables. Both ways are good. 2. Heat the oil in a large, heavy Dutch oven over medium high heat. Generously salt and pepper the ribs and place them in the pot to brown on all sides. 3. Remove the ribs to a plate and cover loosely with foil. 4. 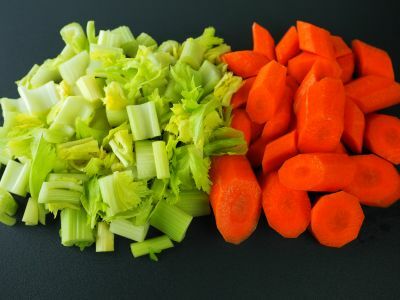 Add the onion, celery, carrots, rutabaga, and garlic and saute until the onion is becoming translucent, about 3 to 4 minutes. 5. Add the ribs along with the thyme back to the pot and cover with water until the water comes about half way up on the ribs. 6. Bring to a simmer, cover and place in the oven. Cook for about 1 1/2 hours until the meat is tender but not falling off the bones. I prefer the meat to be whole and able to be sliced without falling apart. That is to say not shredding off the bone when you pull it with a fork. If you prefer it that way, continue cooking for another half hour or so. 7. Remove the meat from the pot and cover loosely with foil. 8. Separate the vegetables from the liquid by pouring through a strainer. Reserve both the vegetables and the stock. De-fat the stock and discard the fat. 9. 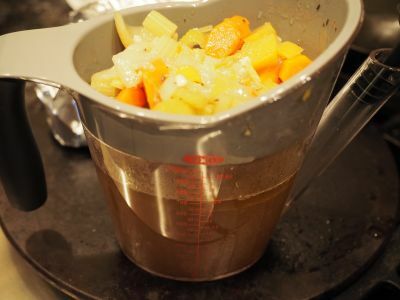 Add about 1/2 cup of the stock to the vegetables and puree with an immersion blender or food processor. 10. 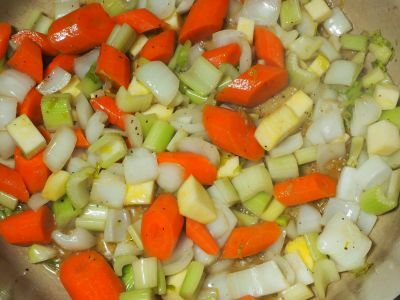 Use the stock to make gravy and then add about 1/2 to 1 cup of the pureed vegetables to the gravy if desired. 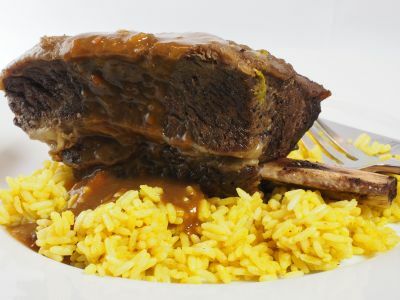 The picture below is one of the ribs served over curried rice with a little of the gravy spooned over it. You can serve it with mashed potatoes and whatever else you like with meat and gravy. This is so intensely flavored you'll defineitely come back for more. Enjoy! My friend is doing the ribs they had at Kroger, not the best, but funny he said he's doing them the same way your recipe says! 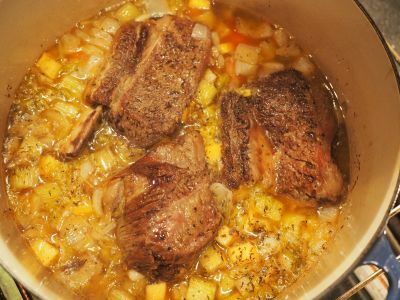 Yes, the vegetables will remain in the pot with the meat and stock during the cooking process. 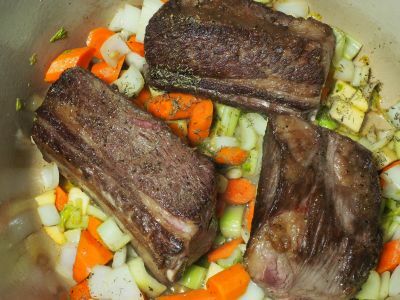 When the meat is coded and it comes out of the oven, you will wrap the meat in foil to keep it warm and then separate the stock from the vegetables and then make the gravy. Tom, thanks for the input. Once you put the liquid in the pot and bring it to a simmer on the top of the stove, cover it and then put it in the 275 F oven for about 1 1/2 hours. And during that 1 1/2 hour time period there is not reason to check on it. 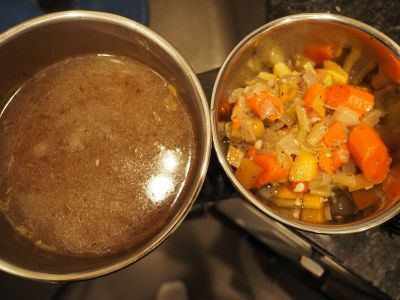 Regarding the gravy, I separate the stock from the vegetables into two containers. 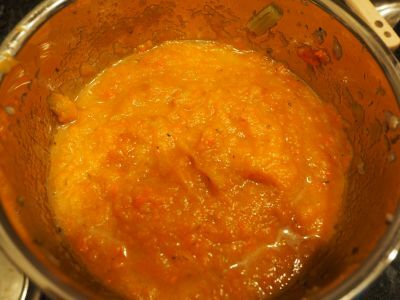 Pour a half cup of the stock into the vegetable bowl and blend that with an immersion blender, or just mash it with a potato masher. Next I make a roux with about 3 T of oil and 3 T of flour and cook that for a bit. Then whisk in 2 c of the stock to make a gravy. 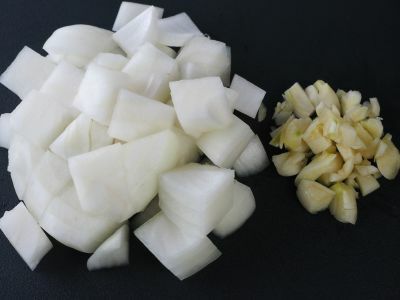 Now you can add as much or as little of the vegetable mix into the gravy and simmer it for about 5 or 10 minutes. Enjoy!